Instant kill, high area-effect damage. Avery Johnson: "Heavy pistols, and a hammer." Avery Johnson: "A giant hammer, sir. On their leader." The Fist of Rukt, also known as simply the Fist, is a Jiralhanae ceremonial war hammer exclusively used by the Chieftain of the Jiralhanae. Originating from Chieftain Rukt of Maccabeus' clan, it was notably used by Tartarus throughout the Human-Covenant War. The Fist of Rukt originated in early Jiralhanae history, when the species first explored barely accessible areas of Doisac. A scavenging pack of marauders discovered a cache of rare and extremely resilient metals in an ancient ruins; some of these metals included a large stone that would become the head of the Fist of Rukt. For the following decades, the Fist of Rukt was used by clans of nomadic Jiralhanae, until the weapon eventually fell into the hands of Chieftain Rukt. Rukt used the weapon throughout the First Immolation, as he and his descendants killed thousands with the hammer. The Fist of Rukt became a ceremonial hammer passed down from Chieftain to Chieftain in the ruling clan of the Jiralhanae. This tradition had been celebrated by the clan for numerous generations. It is regarded as a holy object to the Jiralhanae, and was expected to be treated with great care by its handler. Throughout the hammer's long history, the haft of the Fist of Rukt had been broken and reforged numerous times. During the Jiralhanae's induction into the Covenant until the First Battle of Harvest, Chieftain Maccabeus held control of the weapon after he had killed his own father in a duel. 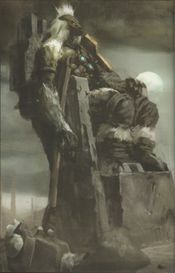 Tartarus sitting upon his throne with the Fist of Rukt in hand. During the Battle of Harvest, Maccabeus' nephew, Tartarus, began to doubt his uncle's competence. This ultimately led to a duel in which Tartarus killed Maccabeus and claimed control of his clan and the Fist of Rukt. Tartarus later used the hammer towards the end of the battle to engage Harvest militia forces aboard the Tiara. After the High Prophet of Truth appointed Tartarus the Chieftain of the Jiralhanae the Fist of Rukt was upgraded with Covenant gravity technology, becoming the template for the standardized Type-2 gravity hammers. The war hammer rarely left Tartarus' side, and he frequently used the Fist of Rukt to ensure obedience from the other species placed under his control. Tartarus would also use the hammer to eliminate any chieftain that attempted to challenge his command. Tartarus eventually carefully increased the hammer's haft to account for the upgrades added by the Covenant. Tartarus continued to wield the Fist of Rukt throughout the Human-Covenant War. After the end of the Raid on the Threshold gas mine and Arbiter Thel 'Vadamee had killed Sesa 'Refumee, Tartarus arrived and used the Fist of Rukt to capture 343 Guilty Spark by sending the "Oracle" hurtling towards the hammer. Tartarus proceeded to grab the monitor out of the air and send him up the gravity lift of the nearby Type-52 Phantom. After the conclusion of the Battle of the Quarantine Zone on Installation 05, Commander Miranda Keyes and Sergeant Major Avery Johnson of the UNSC were able to retrieve the Sacred Icon from the installation's Library. Thel, however, knocked Johnson unconscious and engaged in a firefight with Keyes until Tartarus arrived. The Chieftain was able to levitate Miranda towards himself with the hammer, knocking her unconscious. Subsequently, Tartarus used the Fist of Rukt to attack Thel 'Vadamee, using the gravity shockwave to send the Arbiter flying into a pit below—beginning the Great Schism. At the Control Room of Installation 05, the Arbiter, Johnson, numerous Sangheili Councilors, Zealots, Ultras, and Special Operations Sangheili attempted to kill Tartarus and deactivate Installation 05. The Fist of Rukt was one of Tartarus' advantages, and despite being heavily outnumbered, the massive area effect damage was able to send most of the Sangheili into the air, killing them, and stalwart Sangheili that attempted to attack Tartarus at close range with energy swords were beaten to death by the massive Fist of Rukt. After the Arbiter and Johnson killed Tartarus, the Fist of Rukt fell from the Jiralhanae Chieftain's limp hands. It is unknown what became of the Fist of Rukt after Tartarus was killed on Installation 05, though it is possible that the Sangheili confiscated it. An Unggoy encountered by John-117 while escaping Installation 08 claimed to be in possession of the weapon. Tartarus wielding the Fist of Rukt in Installation 05's Control Room. The Fist of Rukt was essentially a long-handled war hammer with a stone head that approximately weighed as much as an adult male human. Although simple in design, it was a very powerful weapon. It could crush the hood of an M12 Warthog LRV, or reduce an Unggoy to a bloody pulp. The Jiralhanae-wielder's strength further increased the deadliness of the hammer. The Fist of Rukt was 235.7 centimetres (92.8 in) in length, with the handle being 195.6 centimetres (77.0 in) long. The hammer's long handle is topped with a rectangular power core that generated powerful energy fields. The four gravity generators on the head's striking side generate gravity shock waves capable of crushing opponents, while the two generators on the reverse side provide additional momentum to swings. 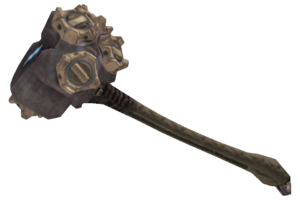 Originally a primitive stone cudgel wielded by ancient Jiralhanae leaders on Doisac, the Fist of Rukt was outfitted with advanced gravity impellors and an advanced drive system by the High Prophet of Truth after the latter put Tartarus in a position of control over all Jiralhanae later in the Human-Covenant War. Its upgrades also made it capable of emitting various kinds of energy fields, which could manipulate objects, or generate powerful gravitational vortices and shockwaves. The shockwaves were capable of blasting enemies away from the user. The Fist of Rukt's gravitational manipulation capabilities allowed the wielder to use the hammer to hold objects, such as Forerunner monitors. When the hammer's gravitational manipulation capability was used against a human female, Commander Miranda Keyes, she was rendered unconscious by the gravitational force. "Rukt" translates to "blood" in Sanskrit. The Fist of Rukt's cultural history with the Brutes is similar to that of the Norse mythological hammer Mjölnir, which was wielded by Thor. Gravity hammers in Halo 3 are inspired by the Fist of Rukt but were originally going to share an even more similar appearance than the final outcome, as seen in the Et Tu, Brute? video documentary. In Halo 3, Grunts seem to have become obsessed with the Fist of Rukt, or at least the sheer power of the gravity hammer. Normally with the IWHBYD skull on, in their sleep a Grunt will say, "Rukt...Fist...Merry Christmas" and "Fist of Rukt". Sometimes during combat, Grunts will also say,"Bring up the Fist of Rukt!" In addition, the Final Grunt says he has it, though this is considered non-canon as the Final Grunt is just an Easter egg. Grunts will occasionally yell "Oh no, the Fist of Rukt!" if the player charges at them with the gravity hammer. On the level Sierra 117, at the dam, if the player passes a lone Grunt while wielding the Gravity Hammer he often will say, "He still wields the Fist of Rukt". A hammer similar to the Fist of Rukt is seen in the Halo 3 Believe ad "Diorama" at 00:54, wielded by a Brute Chieftain in gold armor and one Weapons Chieftain, two in the same place at the same time. It is possible that the Fist of Rukt can produce a nearly impervious shield around to the user, though it is more likely that Tartarus was using a different version of the "Invincibility" device which is commonly used by Brute Chieftains in Halo 3 and Halo 3: ODST. Wizkids released a miniature of Master Chief wielding the Fist of Rukt. This is obviously non-canon. The Fist of Rukt gravity hammer used by Tartarus in Halo 2. Tartarus wielding the hammer in combat. 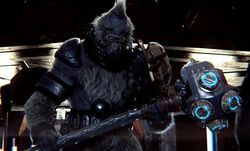 A Chieftain wielding an early Halo 3 gravity hammer that looks very similar to the Fist of Rukt, seen in the ViDoc: Et Tu, Brute?. The Fisk of Rukt being used against the Arbiter in Halo 2: Anniversary. Maccabeus with the Fist of Rukt in Halo Mythos. Tartarus battles Thel 'Vadam with the Fist of Rukt. ↑ Halo 3, ViDoc: Et Tu, Brute?